Today's the day!!! At 9am EST this morning, we are officially open to Red Light/Green Light submissions. Get your contest entries in for a chance at agent feedback on your full manuscript from Alyssa Jennette of Stonesong Literary. 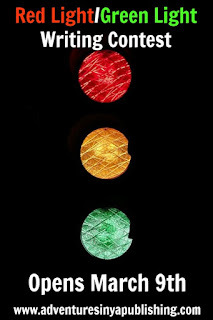 Red Light/Green Light will remain open to submissions until midnight, and we accept NA, YA, and MG entries. Note that the contest does cap out at 50 submissions, and slots are awarded on a first come, first served basis. Send your entries via email to ayaplit(at)gmail(dot)com. Go forth and enter, and may the odds be ever in your favor! I just submitted mine. Any chance I can know if I got in? I imagine I probably didn't.